Mercedes is poised to expand its lineup of wagons with a shooting brake variant of the CLC. The CLS shooting brake is shown. 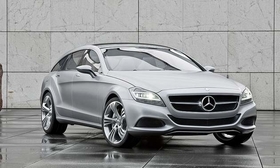 DETROIT -- Mercedes-Benz boss Dieter Zetsche has given approval for a second Shooting Brake model to accompany the brand's eagerly awaited CLS Shooting Brake due out in 2012, according to German media reports. The new model is expected to begin deliveries in 2014. It's based on the German carmaker's upcoming CLC--a four-door coupe that uses a new platform that will offer buyers a stylish but practical rival to the likes of the Audi A5 Sportback and the upcoming BMW 3-series GT. The CLC variant would be priced below the larger and more opulent CLS version. "Shooting brake" is a term used to describe sporty wagons that usually have two long doors. The term is becoming popular again, and Ferrari revealed the FF -- which uses shooting-brake styling -- this spring at the Geneva motor show. The five-door CLC Shooting Brake is set to receive a sloping roof and a heavily angled tailgate that eschews outright load capacity for head-turning style. It will be sold alongside the CLC coupe, which Mercedes has said will go on sale in 2013. The CLC Shooting Brake will come with a new range of four-cylinder, direct-injection gasoline engines, along with the choice of either front-wheel drive or optional all-wheel drive.